Built in 1906 and listed on the National Register of Historic Places, the building was originally the North Bank Railway station. Centrally located in the middle of the vibrant Pearl District and around the corner to galleries, cafés and boutiques (Walk Score of 98!) and within walking distance of downtown. Newly remodeled with all new contemporary furnishings and original artwork in a classic context. Two bedrooms and 2 ½ baths, garage, 2,584 square feet – sleeps 6 comfortably. 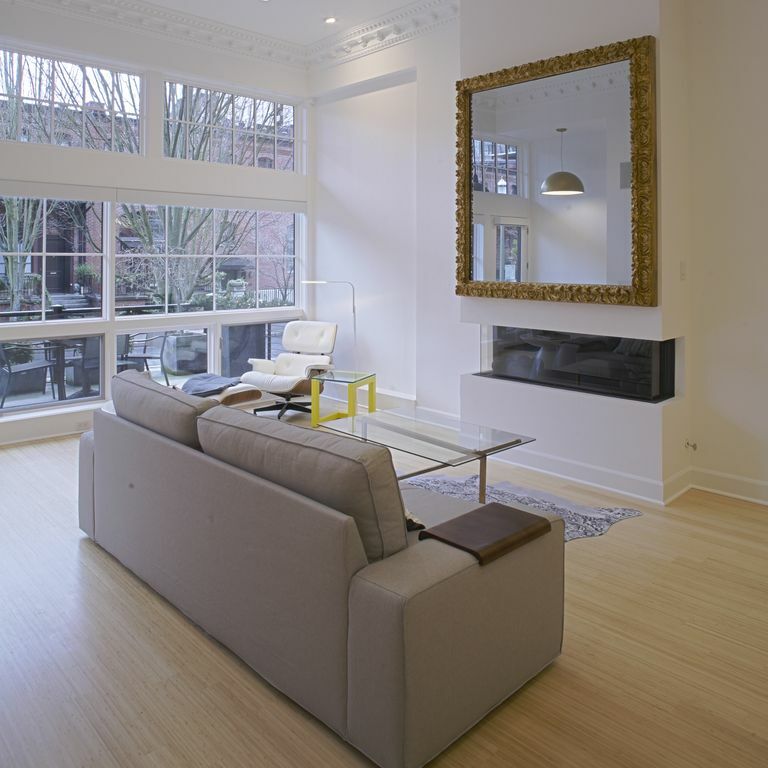 The first thing you will notice is the spacious and airy feeling on the main floor from the 14-foot ceilings. The living area has a linear fireplace and electric shades. The dining area can seat up to 10 people or you can have a quick bite at the breakfast bar next to the kitchen. The large chef’s kitchen is equipped with a Thermador gas range, Sub Zero refrigerator, a full set of pots and pans, herbs and spices, kitchen gadgets and a service for 12 people. The mezzanine, with its own private balcony, is set up as an office with a pull-down queen-size Murphy bed to accommodate extra guests. The second floor has two bedrooms, a media room, and a mini-kitchen / laundry room. The master suite has a king size bed, luxury linens, large master bath and walk-in closet. The guest suite has a queen size bed with its own en-suite bathroom and shower. The upstairs media room has a large <size> TV. The laundry room with full-sized washer and dryer is also configured as a mini-kitchen so you can make coffee in the morning without having to go downstairs. The 440 square foot rooftop terrace has and outdoor living area with deep seating and a fire pit, BBQ and a dining table and chairs for making the most of the good weather. The garage will accommodate 1 medium-sized car comfortably or 2 small cars – ask us if you have a particularly large car or truck to park. Note: this is a two-story property with stairs. 31 night minimum per HOA rules. Located in the vibrant Pearl District with restaurants, cafes, boutiques and galleries just around the corner. Big television downstairs in the living room and upstairs in the media room.